The spirit of creative disruption that characterises Burning Man is akin to the changes sweeping through the advertising industry today, according to Sir Martin Sorrell. The head of S4 Capital, which just announced its second acquisition in the form of ad tech company MightyHive Tuesday morning, said that the advertising industry has to go through radical change. 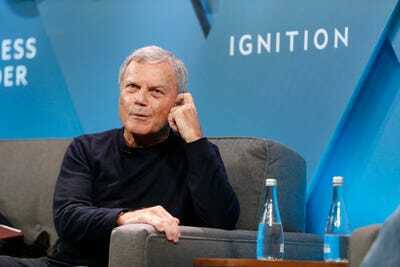 Sorrell also addressed how S4 has been going around pitching itself to investors, saying that S4 was like “a motor torpedo boat” versus legacy advertising businesses. What does the advertising industry have in common with Burning Man? More than you’d think, according to Sir Martin Sorrell. The spirit of creative disruption that characterises the annual pop-up creativity festival is akin to the massive changes currently sweeping through the advertising industry, the former WPP chief said in a conversation with Business Insider UK editor-in-chief Jim Edwards at Business Insider’s IGNITION Conference in New York on Tuesday. The head of S4 Capital, which just announced its second acquisition in the form of ad tech company MightyHive Tuesday morning, said that “there has to be a radical change” in the advertising industry. With MightyHive – which specialises in programmatic advertising – and MediaMonks on its roster, S4 Capital can now seemingly offer full-service digital marketing capabilities. But the “acid test” for the firm would be whether it generates significant differentiation for its clients, Sorrell, who departed from WPP earlier this year, said. Sorrell also shared anecdotes of how S4 has been going around pitching itself to investors, saying that the firm was at an advantage as it doesn’t face any of the challenges that other incumbent legacy advertising businesses inherently come with. He recently told an investment institution, for instance, that with a legacy business, “it’s like trying to weld aircraft carriers together as opposed to a motor torpedo boat,” a thinly-veiled swipe at his former company WPP, which has been trying to simplify its various networks and revive growth by merging entities together.